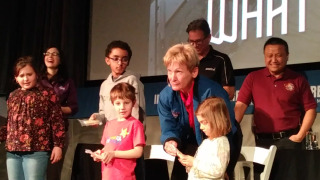 During Kids Week 2018 at the Intrepid Sea, Air and Space Museum in New York, astronaut Peggy Whitson interacted with children in a panel that included demonstrations like this one, where kids guessed what prepackaged International Space Station food products they were holding. NEW YORK — "I think one of the biggest impressions you get looking out the window is perspective," said NASA astronaut Peggy Whitson, remarking on her moments inside the cupola of the International Space Station. "You see billions and billions of stars and recognize that you know some of those have planets, too, and maybe there's life out there, and this is just one of billions of galaxies… and so it gives you this huge perspective of how far we potentially have to go for real exploration." Children of all ages and their space-curious parents would soon meet the record-breaking astronaut, gain some cosmic perspective of their own, and get a chance to ask questions meant for her as well as NASA engineers Howard Hu and Jared Daum, in addition to Joe Cassady, executive director for space at from Aerojet Rocketdyne. "There is a potential to be a big explosion of what spaceflight is gonna mean to just an everyday person in the near future," Whitson told Space.com. "I think it's very hopeful for our young people: all the exciting things that they could be doing in the future relative to space and space exploration." How does a panel of spaceflight experts capture the imagination of children on a Saturday afternoon? Turns out, many kids can name Mars rovers. The first question to the children asked how scientists know anything about Mars, and at least two youngsters in the front shouted, "Curiosity!" "So this is identical to one of the 11 you'll see on the Exploration Mission-1," Jared Daum, parachute engineer for the NASA Orion spacecraft, said Feb. 24. He invited kids to interact with the parachute prototype on the stage of the show, "So you want to go to Mars?" This event was held for Kids Week 2018 at the Intrepid Sea, Air and Space Museum in New York City. But what do kids find gross? Urine. The children largely fell silent when Whitson spoke on the ways astronauts recycle water on the International Space Station, a technology that might be extended to Mars missions. "One of the things I think is really cool that we're testing on board the International Space Station is the water reclamation system. Several young people [today] said we got to take a lot of water to go to Mars or the moon, and we need to be able to recycle as much water as we can," Whitson said. "So even the breath that we breathe out, we collect … our sweat, you know from the air ... but the biggest component is recycling our urine," she added. "I know it sounds bad, but it really is a good thing. And it's gonna enable us to go to Mars with much less water than what we originally thought we'd have to take." The panel asked the audience if they wanted to go to Mars — to a very excited affirmative response. Theirs would be the generation to inherit the modern breakthroughs, and deep-space crewed exploration could be a reality when they grow up. Meeting young people certainly puts progress into perspective, and during the event, the speakers contextualized the timeline for space exploration as they went through the steps necessary to produce NASA's major spaceflight advancements. During her interview with Space.com, Whitson said modern spaceflight is, in aviation terms, somewhere between barnstorming (an early form of plane-based entertainment) and commercial flight. Cassady later mentioned that the four RS-25 engines of NASA's next megarocket, the Space Launch System, are updates from the agency's space shuttle program, speaking to innovations rooted in NASA's legacy. "Diverse capabilities. That's one of the big things," Hu said. "Another thing is … it's such a large undertaking, you're gonna need a lot of help from across the broad spectrum of the world. Not only unique skills that are building particular capabilities, whether it's a module or a power system and things like that, but also just the more enormous amount of effort it takes to build a Mars type of mission." NASA's Exploration Mission-1 (EM-1) mission patch represents the future first launch of the Space Launch System (SLS) heavy-lift rocket. Hu added that strong communication skills will be important because astronauts will be ambassadors for the missions, and need to invite those of us on Earth into their experience. Communication skills, as Whitson can also attest to from personal experience, are also important for interpersonal skills on a Mars mission. Message delays from Mars to Earth will "make it more important that you get along well with crewmates because they are going to be your new family," Whitson told Space.com. "And I think expedition crew skills are going to be extremely important. Basically, how do we play well with others? How do we make our team successful using every individual's assets to make the best and to make sure the mission succeeds?"